A hydrometer is one of the simplest tools a home brewers has at their disposal, but also an important one so I thought I would spend a few moments this week discussing how to properly use a hydrometer and also how to adjust your hydrometer readings for temperature. Most brewers rely on a hydrometer to determine their original and final gravity, and more advanced users will also track mash gravity and end of fermentation gravity. A hydrometer is a very simple device that looks like a large thermometer. When you immerse it in wort or finished beer it sinks to a varying degree depending on how dense the wort is and provides a reading of the specific gravity. Most hydrometers used by home brewers are scaled for specific gravity readings, which is technically a unitless measure that generally ranges from 1.000 for water to 1.100 or higher for high gravity barley wines. An average beer might have a starting gravity between 1.040 and 1.050 and a final gravity around 1.010. The reason specific gravity is unitless is that is is simply a measure of the density of the liquid relative to water – so 1.000 would be the density of distilled water, and most wort or beer has a gravity slightly above that of water (1-10% higher actually). To calculate the specific gravity of a liquid sample with known density, we just divide its density by the density of water – that is the specific gravity value. Many professional brewers use hydrometers that measure in degrees Plato, which is another density system developed by Bohemian scientist Karl Balling in 1843 and later improved by Fritz Plato. This scale is a measure of density relative relative to the percent sucrose in the water, so a reading of 11 degrees plato would be equivalent in density to water with 11% sucrose dissolved in it. Converting from plato to specific gravity is not strictly linear, but most brewers use the approximation of 1 degree plato = 4 points specific gravity, so 12 degrees plato would correspond to 48 points of specific gravity, or a measure of 1.048 approximately. For significantly larger values the approximation starts to drift off, so its best to use a calculator at that point (such as the one in BeerSmith). Use of a hydrometer is a pretty simple affair. You typically remove a small amount of sample wort, place it in a clear sample cylinder and then immerse the hydrometer in the liquid. Read the gravity reading from the scale on the hydrometer where it crosses the water-air boundary. There will be a slight curve along the water-air line (called the meniscus), so if you want to be really accurate you should take the reading at the lowest point in that air-water curve (the bottom of the meniscus). 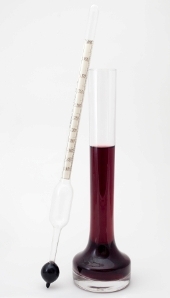 One final cautionary note – many beginners tend to take the sample in the tube that the hydrometer was sold in. You need to be a bit cautious when doing so as the tube is quite small and the hydrometer will sometimes stick to the side a bit which could give you an inaccurate reading. Ideally you want it floating freely in the wort, which is why more advanced brewers will purchase a small sample vessel or use another vessel to hold the sample. Hydrometers are all calibrated to be accurate at a standard temperature. For most home brewing hydrometers, the calibration temperature is 60F (20C), though a few laboratory hydrometers are calibrated to a different temperature (usually 68F/20C). The calibration temperature is usually printed on the scale of your hydrometer in really small letters. Manufacturers calibrate the hydrometer to be accurate at their calibration temperature, and its often a good idea to validate that by cooling a sample of distilled water to that calibration temperature and verifying that your hydrometer reads 1.000. If you use your hydrometer at another temperature other than the calibration temperature you should add or subtract a small adjustment to get an accurate reading. In practice, if you are working near room temperature the adjustment is relatively small (typically one point). However when you measure hot wort (such as wort coming from the mash tun or boiler) the difference can be significant and you should adjust your hydrometer for the calibration temperature. where sg_measured is the measured value, tc is the calibration temperature and t is the temperature (both in celsuis the sample was measured at. This gives a pretty accurate measure, but its not much fun to calculate by hand, so there is a hydrometer calculation tool in BeerSmith to do this adjustment for you. Thanks for visiting the BeerSmith Home Brewing Blog. I hope you will subscribe for regular articles, and hope you have a great week! A great tool, until they bust and shatter everywhere. Handle with care! I have one additional caution in line with your comment about the hydrometer sticking to the side of the container. If you are taking a reading while there is still active fermentation you must be sure that there are not too many CO2 bubbles adhering to the hydrometer. I have found that this can significantly raise the hydrometer causing a false high SG reading. When taking readings under these conditions either get your reading before too many bubbles have had a chance to attach, or tap the hydrometer to clear it just before taking the reading. If you have very active fermentation, a good amount of CO2 will attach in only a couple minutes. Hydrometers, like all other instruments, should not be taken as the word of God. Even after constant readings for 2 consecutive days, I tend to allow the beer to sit in the fermenter for a few more days just in case I screwed up the reading. The additional advantages are that we allow the beer more time to clear and that the risk of bursting bottles will be down significantly. Actually, I do work in the lab and there are plastic hydrometers around. I wonder why homebrew supplies only give us glass ones. I broke a few before and it does piss me off a little. I have one but I don’t think that I have been getting the readings right on it. I usually just give up trying. I did have a time that I should have used it, it would have saved some bottles from blowing up! I have a question about taking the OG reading. When extract brewing, how long should one wait after adding the wart to the fermenter before taking the original gravity reading? I understand that temperature plays a key role, so waiting for the temperature to be constant is one thing, but how about the waiting for any particulate matter to settle.The the density of the liquid is actually what we’re measuring, so therefore it seems logical that I should wait until the large particles have settled to the bottom of the fermenter? I usually take an OG reading after the wort has reached fermentation temperature – which for me means most of the cold break has settled out. Usually this is around the time I add the yeast or right after you add the yeast. I found all of this interesting and informative. I calibrate my hydrometer by testing tap water. As mine floats a bit high, some tape on the (dry) top adds the extra mass. Back to the original article. 20C can’t be both 60F and 68F. There are actually two different hydrometers commonly sold – one calibrated at 68F and one at 60F. You need to know which one you have. First, let me start by letting you know that I am a complete newbie. This is my first EVER batch of anything brewed! I bought a 1 gallon starter kit and am attempting to make a sparkling crabapple cider. I have been following directions in Winemaker’s Recipe Handbook by Raymond Massaccesi, copyright 1976 that I bought from my brewer’s supply store. Page 10, Crabapple. I plan to use this recipe and then prime the bottles for fermentation (did I get that right?) Anyway, I am at the point of checking the S.G with a hydrometer. I am doing a very small batch and do not have a test tube/beaker for use in the procedure. I sanitized the hydrometer and I tried testing directly in the primary fermenting bucket in the crabapple juice mixture (not exactly “wort”, but you know what I mean?) and the hydrometer goes to the bottom of the bucket…no floating. The bucket isn’t deep enough? I tried plain water in a spray bottle and got about 1.000, but I hate to waste a quart of product every time I want to check the S.G.! I’m only doing a gallon!!! Any suggestions? My closest brew supplier in pretty far away. I went ahead and pitched the yeast and started the process, but have no idea of my starting S.G.
Just wondering if there is a reading for instance 1.100 that I should be waiting for my brew to get to before bottling ? Also is there a minimum period of bottling until if can drink it ? I tested with two other calculators (brewtoad.com and brewersfriend.com). Both gives the same result, and it’s equal to the formula showed here. But in Beersmith2 on my smartphone, the result is not the same. It gives me always 2 points up. Is there an error with the app? I’m still a bit overwhelmed by everything I’ve read. Great post though. I have yet to make my very first beer. Still waiting for my Chefast hydrometer and test jar kit to arrive. Bought it on Amazon. About measuring the specific gravity of a liquid sample, which one would you recommend that beginners like me should use—the “water density minus the specific gravity value” or the density system developed by Balling? Thanks!